47713 PER3477.jpg 500X638\PER3477.jpg 47714 PER3477_1.jpg 500X638\PER3477_1.jpg 47715 PER3477_2.jpg 500X638\PER3477_2.jpg Send A Hint! 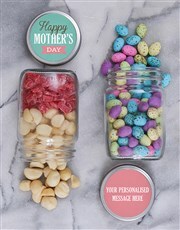 Add your own personal touch this Mother's Day with this Personalised Mothers Day Fruit Jar Set. Two jars have been filled with dried and diced strawberries, macadamia nuts, and speckled eggs. One jar's lid reads, 'Happy Mother's Day' and the second is available for personalisation. Add your personal touch with a special message for your mother. 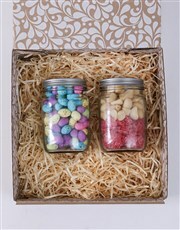 The jars are neatly and safely packaged in a gift box. 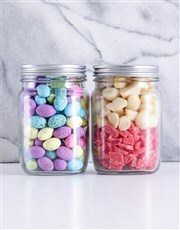 Get this Personalised Mothers Day Fruit Jar Set delivered with NetFlorist.